← Savennières – a rebooted classic? 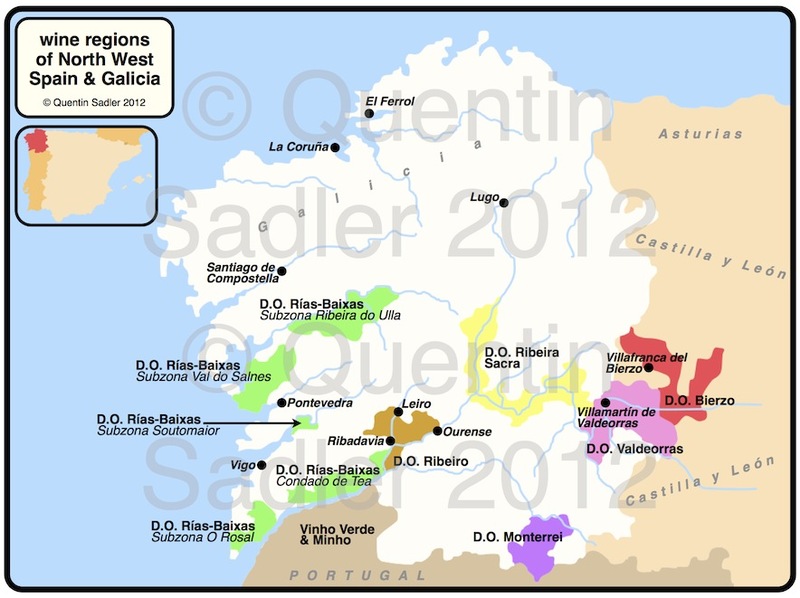 Galicia is home to several wine regions, P.D.O.s, D.O.s – call them what you will – D.O.Valdeorras (Valley of Gold), D.O. Ribeira Sacra (Sacred River), D.O. Monterrei (Mount of the King) and D.O. Ribeiro (river or brook), but the most famous and commercially active is D.O. Rías Baixas (Galician or Gallego sounds quite like Portuguese, so it is pronounced ree-ahs buy-shuss and it means lower inlets). As you can see from my map, there are five sub-zones, but I have not yet tasted enough of each one to tell you what the differences are – if any. Well, recently I was able to add to my experience of this region’s wines when one of the leading producers – Bodegas Terras Gauda – sent me some of their wines to try. I had tasted one before, but here I had a chance to compare the different styles. Only founded in 1990, it isn’t an old winery, but by and large that is something you notice a lot in this part of the world. The link between the local wine making of the past and the present is pretty tenuous and some of the most interesting wines come from these newer producers. Of course there are exceptions, some wineries can claim to have been started a few centuries ago, but really the region really only began to make world-class wines within the last twenty years or so. As for Albariño, the local star grape, it’s a bit of an enigma. The word means white Rhine or the white from the Rhine in Latin, which to me suggests two things. Firstly that the grape has some sort of link with the Church – or Latin speakers anyway – and secondly that people who think this implies that it is a long lost clone of Riesling may have a point. Very long lost though, as the similarities between an Albariño and a Riesling are generally slight. Both are aromatic and floral and both have high acidity, but the thick skinned Albariño tends towards more body and texture than Riesling, so the acidity is usually more in the background – but again there are exceptions. By the way, over the border in Portugal the grape is called Alvarinho. In truth the importance and fame of Albariño is a very modern phenomenon. Presumambly, like many other Iberian white grapes it had to wait for modern techniques, both in the vineyard and winery, to be able to reliably produce good quality wines. In fact the grape had long been neglected and like a few other Galician varieties had to be coaxed back into life from near extinction. I was astonished when in Portugal the other month to discover that the first Vinho Verde estate to treat Alvarinho as the star grape – Quinta de Soalheiro – was only created in the mid 1970s. This was a new wine to me and I fell for the aromas which have a note of wild herbs and samphire with a salty smack of the sea. The palate is then quite fat with ripe pineapple and nectarine characters together with mineral notes and high acidity that cuts through making the finish very clean and fresh. The balance between the richness and freshness makes it wonderfully drinkable – 89/100 points. Around £14 a bottle in the UK. This is the more famous wine from Terras Gauda and this time it is a blend of 70% Albariño, 20% Loureiro and 10% Caiño Blanco. Of these Loureiro is especially aromatic in a herbal way while while the rare, local Caiño Blanco is smoky and mineral with rapier-like high acidity to add freshness to the blend. This was more complex, as you might expect from a blend, with more herbal notes and a salad-like freshness on the nose together with a creamy ripeness. The palate offered crisp citrus and something a little fatter and succulent with almost a lemon curd zing and smoky minerality that just cries out for a bit of perfectly cooked fish. I thought this was beautifully poised and elegant – 91/100 points. Around £15 a bottle in the UK. They also sent me a bottle of their third white called La Mar. Sadly it was slightly corked, so perhaps I will taste that another time. If fresh, unoaked, concentrated, balanced and beautifully made white wines with a dash of minerality, loads of character and a feeling of purity are your thing – and they are mine – then these are very good wines and just the thing with simply cooked summer food. Galicia can produce some excellent red wines and has a grape that it can claim as its own – Mencía. Recently I have been especially taken with some made by Viña do Campo and Dominio do Bibei in D.O. Ribeiro. Terras Gauda though have decided to base their red wine operation – Viñedos y Bodegas Pittacum – in the nearby D.O. Bierzo. 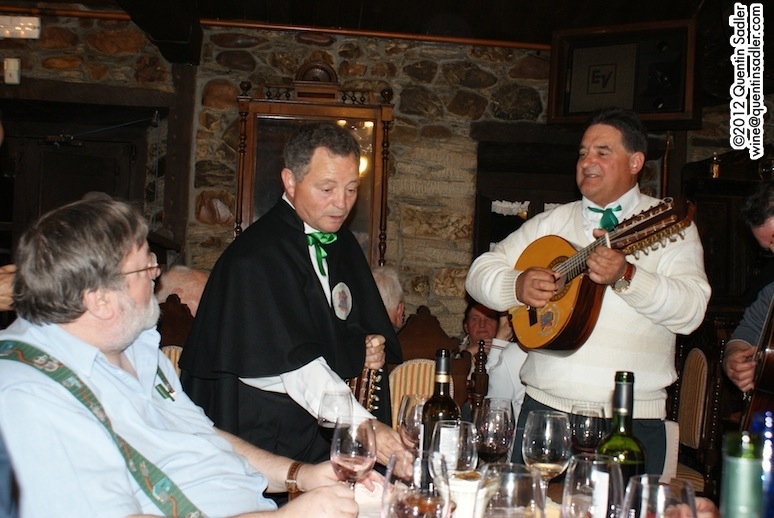 Although Bierzo is politically a part of Castilla y León it is spiritually and culturally Gallician and indeed was considered part of that region until the 1740s. 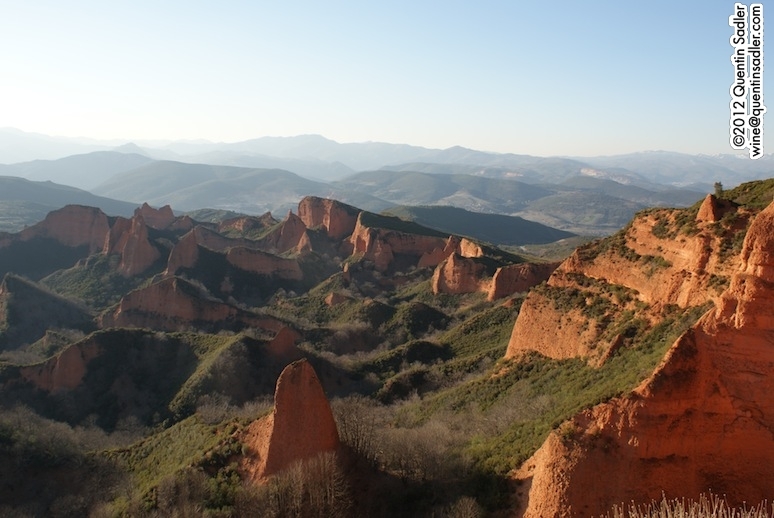 Bierzo is more inland and sheltered behind some mountains – that include the amazing Las Médulas World Heritage Site once the most important gold mine in the Roman Empire – as a consequence it appears to me that the reds from here can be a little riper and more concentrated. By the way Mencía has long been thought by locals to be a clone of Cabernet Franc, so much so that on my trip there I was explicitly told this as a fact. Yet science does not seem to bear this out and recent research seems to show it is the same as the Jaen grape. Made from 50-80 year old Mencía vines and aged for 8 months in French & American oak – 14.5% alcohol. The nose was completely dominated by the oak that had a sort of hard spice coffee and cocoa aroma with a little blackberry fruit seeping through. The palate opened up to be very smooth and voluptuous – about as close to full-bodied as Spain gets. It was mouth-filling with rich black fruit, dry spice, earthy mineral notes and silky tannins. Much to my amazement it carried the alcohol without a problem. It is a big wine, with big fruit, but is delicious – 90/100 points. Made from the 80-100 year old Mencía vines in their Areixola Vineyard and aged for 14-20 months in French & American oak – 14.5% alcohol. This was a real step up in concentration with floral, vanilla notes as well as some prune and caramel. The palate was intensely fruity and rich – almost to the point of seeming to have some sweetness – it’s smooth, concentrated and full-bodied with kirsch and chocolate and spicy, coffee tinged oak. The tannins are very supple and ripe. It is big, but fascinating and finishes elegantly despite the power. A blockbuster, but it works – perhaps it might be more me with a little less extraction and alcohol, but it was very good – 91/100 points. Around £40 a bottle in the UK. Terras Gauda and Pittacum wines are distributed in the UK by Les Caves de Pyrene. If you are looking for something really different and not at all what most people expect from Spain, then these reds are really well made and deliver rich, concentrated fruit with supple velvety tannins in a way that many people will enjoy. Mencía is a terrific grape that deserves a bigger following and which makes many different styles of delicious wine from fresh, light, juicy and unoaked to richly glossy and ambitious wines like these that have an almost international feel to them. Go on try some soon, you won’t regret it.